It’s a cake stand! Made of pastillage! 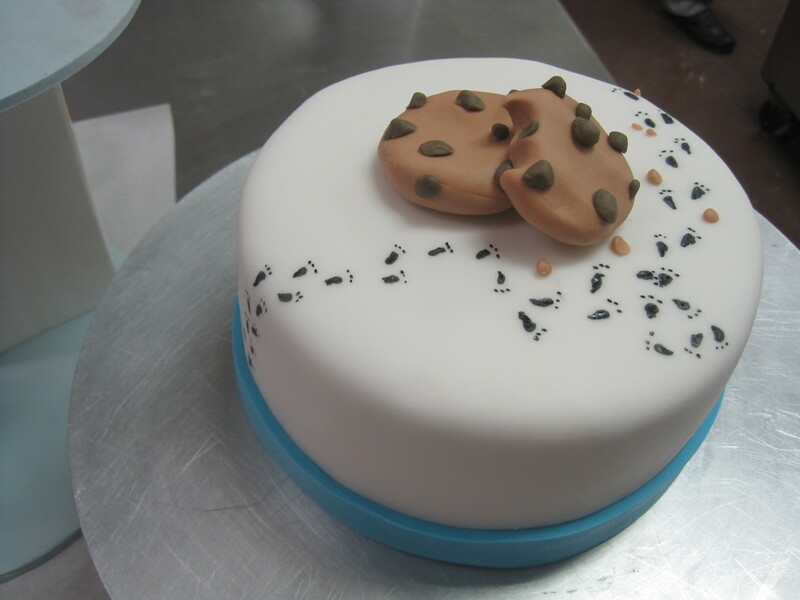 Pastillage. Pah-stee-YAHJ. It’s really just a paste made from sugar, cornstarch, vinegar and gelatin – you roll it out like pie dough and cut it into shapes, and it dries hard. Then, barring any major disasters (this stuff is de-li-cate. 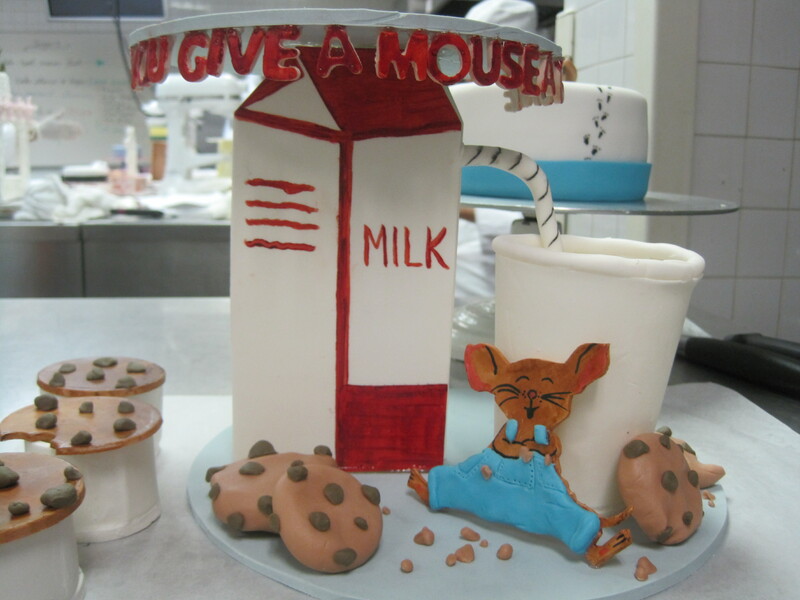 It likes to crack and shatter), you can glue your shapes together with royal icing or isomalt, and voilà! You know, I’m sort of sensing a trend with these showpieces. I think someone has a Peter Pan complex. Oh, what, you think it’s me? Just because I happen to like chocolate chip cookies? 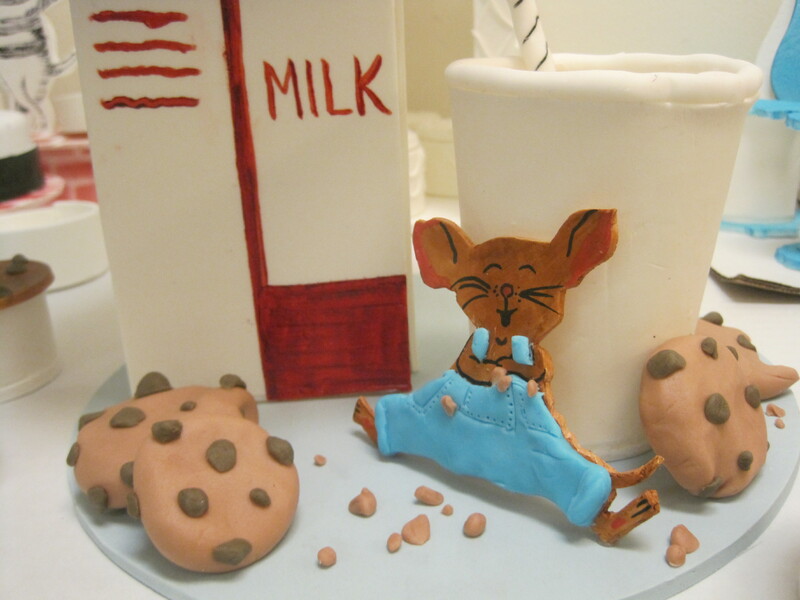 And adorable mice? 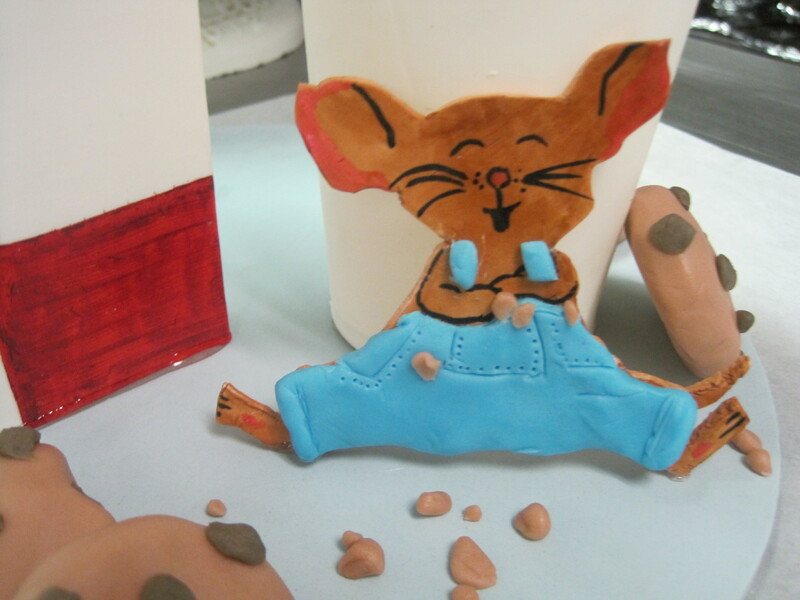 Tiny little sugar mice who like to wear overalls and cookie crumbs? …Fine. 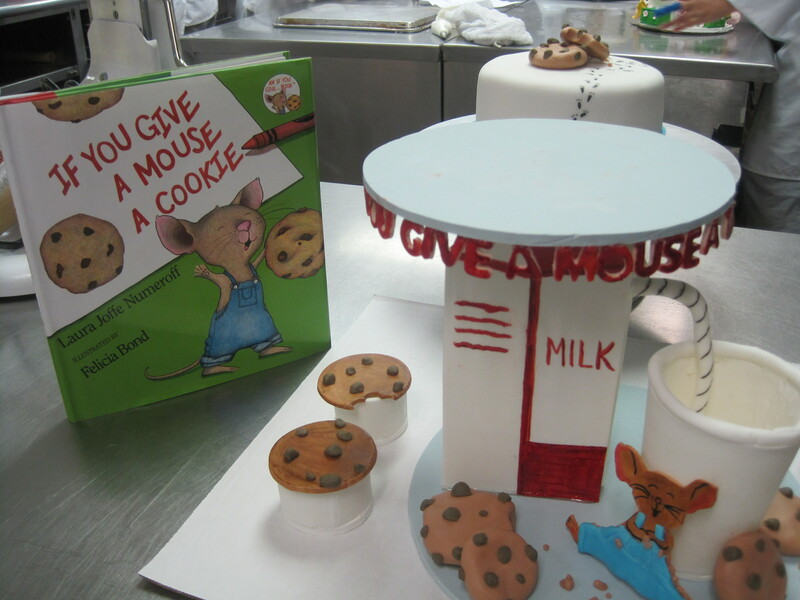 But I mean come on – have you ever read If You Give A Mouse A Cookie, by Laura Joffe Numeroff (great name, by the way)? If you haven’t, you should. And if you have, you sorta like my cake stand, don’t you? Admit it. You want a cookie. I wonder what happens when you give a blog-reader a cookie. Let’s find out, shall we? Working in a large pan over medium-high heat, brown the butter. Just swirl the pan of butter over the heat until the milk solids start to separate and turn brown. Once the butter is browned, pour it into a metal bowl and put it in the freezer to cool. Once the butter has completely cooled to room temperature, whisk it vigorously with the sugar until it is light and pale yellow. Whisk in the eggs one at a time until thoroughly blended. Mix in the vanilla, then stir in the flour mixture gently, until combined. Fold in the chocolate chips. Using an ice-cream scoop or two spoons, drop the batter by the tablespoon onto the prepared baking sheets. 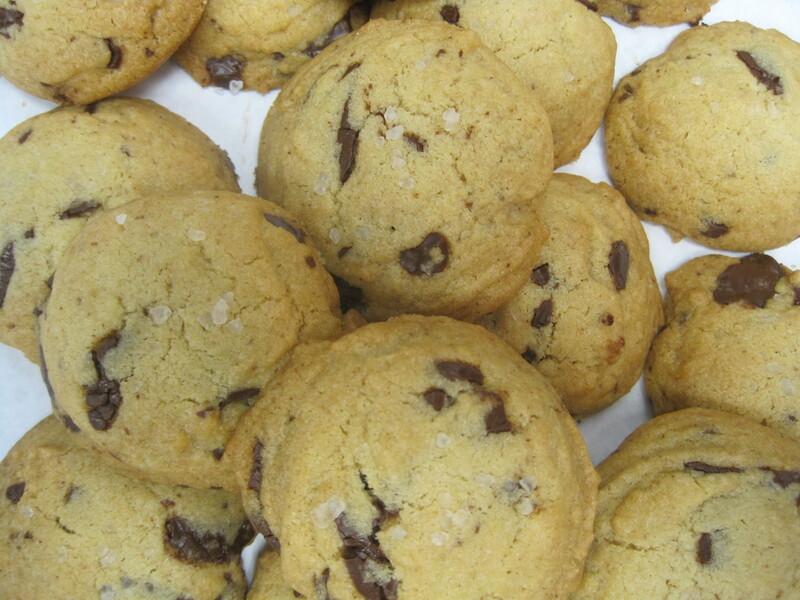 Sprinkle each of the cookies with some sea salt, and then bake for about 12-15 minutes, until the edges have browned and the cookies are golden. Allow to cool, about 5 minutes, before enjoying… with a glass of milk, naturally. Love the cake stand! I'm completely addicted to Ace of Cakes and shows like that, though I've never attempted to decorate a cake or do any kind of sugar work. You have real talent! you are INCREDIBLE, chef molly!!! !